Twenty-five years ago in the late summer of 1987, Michael Jackson released his long-anticipated follow-up to Thriller, the Bad album. Bad went on to produce five No. 1 hits, several classic short films, and a record-setting world tour. To date, it has sold an estimated 30-45 million copies. To celebrate the milestone, the Estate of Michael Jackson and Epic/Legacy Recordings will release a three-CD package (Bad 25, out September 18), which includes the remastered original album, an album of bonus tracks, including demos and remixes, and a live album from his Bad World Tour. Along with the new songs, the highlight of the Bad 25 box set is undoubtedly the "Live at Wembley" full concert DVD. This is a remarkable piece of history that might have been lost if not for a fortuitous discovery among Jackson's belongings. The Wembley shows are the equivalent of the Beatles at Shea Stadium in 1965. But make no mistake: Jackson's performance here eclipses even his most talented predecessors. Unfortunately, in spite of an extensive search through the pop star's storage archives, Jackson's estate was unable to locate the original Umatic master tapes for the Wembley shows. Perhaps one of these days, they will show up somewhere. What they did find was a personal VHS copy of the concert from the singer's own video collection. "Even finding this VHS felt like a miracle to us," says estate co-executor John Branca. A consummate perfectionist, Jackson often watched tapes like this of his shows to ascertain whether the "magic" was being captured and what could be improved not only in his own performance, but that of the rest of the crew. This was his viewing copy for the legendary July 16, 1988 performance, attended by 72,000 people, including Princess Diana and Prince Charles. While the sourced footage remains "pre-HD, 1988 videotape quality," it has been restored by a team that has also treated recovered footage for NASA. The result isn't a perfect high definition picture, but for me, at least, took little away from the enjoyment of the experience. Watching the DVD is like being transported in time. It feels like the era it comes from. Generally, it seems the closer and mid-range shots are much sharper, while the distant shots can sometimes be a bit blurry. Fortunately, because the camera work is so good, we get many brilliant close-ups of Jackson that might almost be mistaken for high-definition. Add to that that the original audio was captured on multi-track and presented in 5.1 audio, and it is hard to complain about the results. The Bad World Tour began in September 1987 in Japan and concluded nearly sixteen months later in January 1989 in Los Angeles. It became the highest-grossing and most attended concert series in history. Jackson played to an estimated 4.4 million fans in fifteen countries. It was also his first and last solo tour in North America. The London shows came in the midst of the second leg of the tour. Michael-mania was sweeping through Europe. In Vienna, Austria, the Associated Press reported that over 130 people passed out during the concert. By the time he reached London excitement had reached a fever pitch. All seven concerts at Wembley Stadium sold out, shattering a record previously held by Madonna and Bruce Springsteen. Watching the July 16 show on DVD 24 years later one can still feel that visceral energy and excitement in the stadium. When Jackson finally appears out of the smoke and starts into the opening number, "Wanna Be Startin' Somethin,'" the crowd erupts. This is Michael Jackson at the height of his performing powers. Yet part of what makes the performance so enjoyable is how stripped down and spontaneous it is (by Jackson's standards), from the stage design, to the costumes, lighting and overall presentation. Music director Greg Phillinganes heads up a dynamic band, elevated just behind the stage, while Jackson is flanked, on many of the choreographed numbers, with a talented group of androgynous, Blade Runner-esque dancers (including Lavelle Smith). The minimalist approach allows Jackson's talent -- as a dancer, singer and performer -- to shine through. He is loose and exuberant, like he's simply having a great time, and we're there to watch in. Jackson sings live throughout most of the show, and improvises to brilliant effect in certain parts. At the conclusion of "I'll Be There," for example, he begins ad libbing like a gospel preacher possessed by the spirit. He does call and response with his backup singers and with the audience. "Can you feel it!" he exclaims. Dripping with sweat, the music pulsing through him, he begins rhythmically tapping his foot, then scatting, before launching into the next number. Other highlights abound. Jackson's locking, popping, miming rendition of "Human Nature" and its ethereal cries directed outward to the audience. The intro to "Smooth Criminal," in smoky silhouette, which gives way to the now-famous, but still captivating high-art choreography. The extended drum-solo postlude to "Billie Jean" that allows Jackson to improvise to the beat -- gyrating, kicking, tapping and gliding. Part of what makes Jackson so compelling as a performer is how his body is constantly in motion and completely in-sync with the music. For the entirety of the show, he becomes, as he often said, "the medium through which the music flows." One of the most enjoyable moments actually comes at the end as Jackson playfully introduces his backup singers, guitarists and band. It gives a sense of his humor and joy in being a part of a creative collaboration. He also allows a group of children on stage, who earnestly try to imitate their idol's dance moves. The show concludes with a breathtaking encore performance of "Man in the Mirror." As Spike Lee (who ended up using the performance to conclude his Bad25 documentary) says, "If you look at that performance, he's somewhere else. That's one of the great performances ever. You see the way Michael's singing that song -- he's not of this world. He's somewhere else." 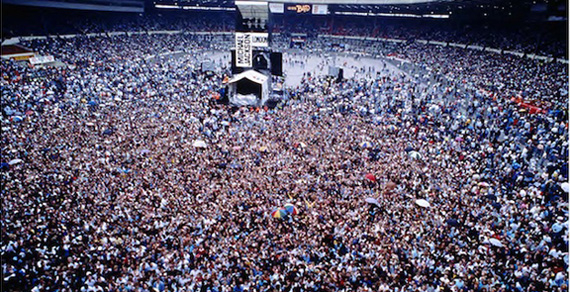 Jackson played a total of seven shows in London to an estimated 500,000 people. Ticket demand was so strong it was estimated he could have done at least 10 more sold-out Wembley concerts if he had desired. Everyone wanted to witness the phenomenon that was Michael Jackson. On September 18, after years of gathering dust in storage, the world will finally have the chance to experience the magic again.